I'm NOT Disordered: HALF A MILLION READERS!!! | LESSONS LEARNT, ADVICE & MORE! I remember getting my first one hundred readers and the girl that I was closest to in Hospital had come running to my bedroom door and we were standing hugging and screaming, then the staff came running down the corridor thinking that a patient was ‘kicking off.’ When we were laughing about it later, one of the girls asked me why it mattered how many people read my blog. At that point, I think it was just cool to think that one hundred people read the crap I wrote at the end of the day. Now that blogging has become a career for me, the amount of people that read I’m NOT Disordered is pretty essential to its success. The truth is, when you write to organizations with requests for collaborations, you’re taken a whole lot more seriously if you can say you have half a million readers as opposed to having one hundred. But my deep rationale – the one that’s always been there - for celebrating the rise in popularity has always been about it meaning that I have the opportunity to have more and more people benefit from the blog’s content. I’ll never forget after posting a piece about the benefits of reporting your trauma, I received a message from a reader saying that she’d told the police about the abuse she suffered as a child – over 20 years ago. Helping that one person to take that one huge step… well, if I have the potential to do that times half a million…?! One of the biggest lessons I’ve learnt from blogging has been that the motto my Mum often says, ‘shy bairns get nowt;’ is definitely true! Before I’m NOT Disordered, I was quite shy when it came to talking about myself but I’ve learnt that doing so, is needed to raise the blog’s popularity and maximize on opportunities. As soon as organizations began to show an interest in, I’m NOT Disordered, I decided that I didn’t want to become one of those Bloggers who sits back and waits for offers to role in. I wasn’t about to expect opportunities to be handed to me on a plate; I wanted to work for them because I knew that doing so would mean that they were more special to me than if I’d been complacent and lazy about it. The satisfaction of earning a collaboration is so much more rewarding than just hoping one will come along. I think that some Bloggers seem to roll on their success and become a little full of themselves in feeling that it’s belittling to have to approach organizations and ‘beg’ to work with them. To be honest, I actually enjoy securing collaborations; it becomes a huge achievement when I’m successful and get to see my ideas come to life! For new Bloggers or even established ones; I’d tell them to be imaginative with their collaboration ideas. In blogging about mental health, I’ve learnt just how many aspects of life it comes into. Being passionate about ridding the world of mental health stigma has given me more motivation in contacting a huge variety of organizations and illustrating out how mental health can come into their work (if it wasn’t so obvious in the first place!). For a lot of companies - like Cats Protection – it’s quite well known how mental health comes into it (the benefits pets have on a person’s mental health) but it’s not really something that is stressed or concentrated on. Sometimes, it’s also important to show that a company – like Oliver Bonas – recognizes the importance of raising awareness of mental health and is passionate about their company being a part of this. 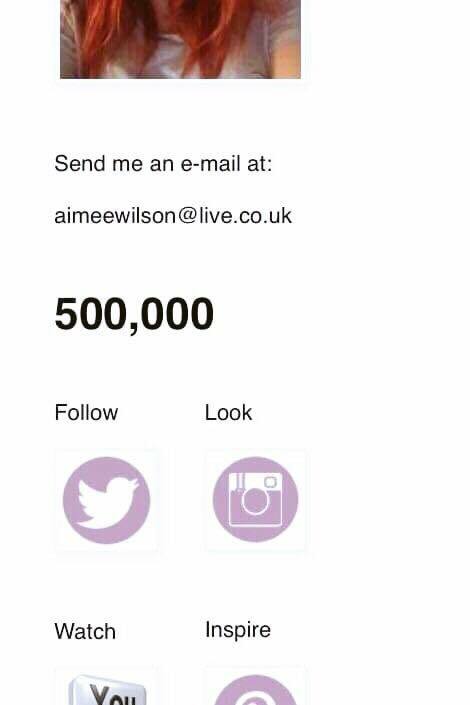 There was no way that I was going to write a post celebrating half a million readers without including some thank yous to the special people and organizations that’ve helped I’m NOT Disordered get this far! My only concern is that I’ll miss someone out and they’ll be a bit put out by it… But I think it’s important to give it a go! To individuals, thank you for believing in me and I’m NOT Disordered, for supporting my mental health through the challenging times, and celebrating the good times with me: Mum, Auntie Angi, Lauren, Ellie and the God-Children, Martin Baker, John Lawlor, Inspector Steve Baker, Claire Andre, and Chris Jackson. To organizations, thank you for saving my life, trusting me with your reputation, and allowing me some fun opportunities: Cats Protection, English Heritage, National Trust, Oliver Bonas, Northumbria Police, Northumberland, Tyne and WearNHS Foundation Trust, Cygnet Healthcare, Future Learn, North East Ambulance Services, Barnardos, LEAPS, Richmond Fellowship, and Time To Change. I’d like to use this post as an opportunity to tell you about the next biggest collaboration for I’m NOT Disordered… I’m really proud to announce that I’ll be working with London North Eastern Railway (LNER) to illustrate the benefits that travel can have on your mental health.